Our everyday lives are ruled by plastic. It’s in the products we buy, it’s in the packaging we buy those products in and it’s in the bags we use to bring those products home. When we’re done with plastic, at best it can be recycled. But whether through littering or by being placed in the wrong bin, millions of tonnes of plastic end up in our landfills every year. And from there, loose plastic can make its way into our waterways, and ultimately, to the ocean. Once there, that plastic is deadly to marine life. The bellies of whales are found filled with plastic bags. Fish can become permanently disfigured after getting trapped in six-pack rings. Plastic straws too-often end up choking sea turtles. And it’s not just marine life that is suffering. Plastics don’t biodegrade (cannot be decomposed by living things). Rather, they break down into ever-smaller pieces called microplastics. Those microplastics are eaten by small organisms such as plankton, which are then consumed by larger organisms such as small fish, and so on and so on. As top predators in some seafood food webs, it is ultimately us that wind up with that plastic in our systems. In fact, in October 2018 a study showed that microplastics are now being found in our poop. That’s just gross! Over 99% of the toothbrushes in the world are made using non-recyclable plastic (hard plastic for the handle, rubber for the handle and nylon for the bristles). 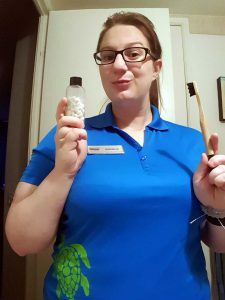 Not only are bamboo toothbrush handles biodegradable, but with its antimicrobial properties, bamboo is a more sanitary alternative to plastic. 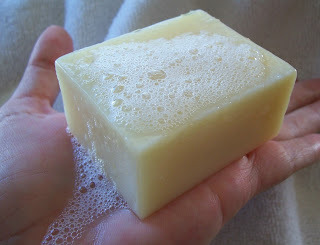 By switching from conventional liquid shampoos in disposable plastic bottles to shampoo bars you can reduce your plastic use AND save money. Shampoo bars last longer than shampoo bottles, as consumers are less likely to waste product by pouring out more than they need. Bars are also less likely to contain chemicals such as sulfates, which can damage your hair over time. Saving plastic, money and my hair? Sign me up! Invest in a long-term razor. By replacing the disposable plastic in our lives with longer-lasting alternatives we benefit from better-made products that have the potential to save us money in the long-term. Such is the case with the classic safety razor, which requires only the replacement of (recyclable) metal blades rather than the entire razor handle and head. After the initial purchase of a safety razor, blade replacements will run you about $0.50 each. When it comes to grocery shopping, there are brands that come wrapped in lots of disposable plastic, and others that are packaged with more environmentally-friendly materials, such as cardboard. While it might be difficult to avoid plastics entirely while grocery shopping, making a move toward buying (and not wasting!) fresher products (which require less packaging for long-term freshness) and staples such as detergents in boxes vs bottles can reduce the amount of plastic stocking your cupboards. The plastic problem in our oceans can seem overwhelming, but we have the power to purchase products that help reduce our environmental footprint, and let companies know (through our dollars and cents) that we care about protecting our planet. Consider making a pledge to lower your plastics use today, and spread the word about it to your family and friends. Check out the hashtag #liveplasticfree online and on social media for more ways in which you can choose to live with less plastic today and every day. How do you reduce your plastic use? Please share in the comment section!